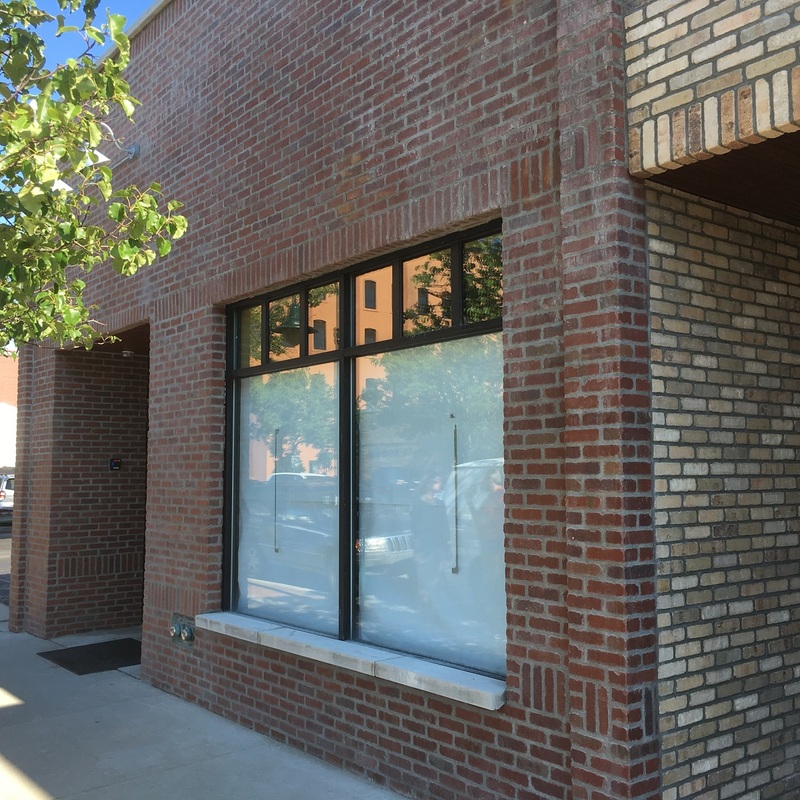 On Friday, July 7, MyNorth Intern Kramer Schultz was sent out to see if the rumors about a new Traverse City speakeasy were true. This is his adventure. If you listen closely, through the excited screams of children as their favorite ride spins them upside down; hidden under the roar of passing vehicles hauling families, dogs and inner tubes; you can hear the faintest whispers of a new place in town—an attraction that doesn’t have neon lights announcing it’s “OPEN,” only a hidden door that opens with a password. In the midst of National Cherry Festival in downtown Traverse City, word is spreading about an underground speakeasy hidden in the cracks of the city. When I first pushed open the black steel door and entered the cool air-conditioned building at work, I had no idea what I would be doing. All of my interviews were scheduled for next week and I had no other stories planned for the day. I unpacked my green and white Under Armour backpack and flipped open my sticker-studded laptop. While refreshing my inbox for nearly the tenth time, my boss suggested I head out to the Cherry Festival and take some videos of the Air Dog Competition taking place in Clinch Park. To me, that meant I would be spending an hour in the blistering 80-degree heat; at least I’d be able to grab a slushie—and a hot dog! But, before I turned back around, she also suggested something else; her chair rolled closer on the brown office carpet as she began to tell me about a hidden speakeasy somewhere within the city. “No one knows the name,” she said. “And no one seems to know where it is. I heard it was connected to a flower shop or something, I don’t know.” Those were my leads and my goal was to find it. I scooped up my phone, my sunglasses and my half-full bottle of Aquafina (the essentials) and snuck out the front door onto Park Street. As I crossed over the threshold between office and sidewalk an invisible heat wave wrapped itself around my body and within minutes my clothes were sticking to my skin. I had a mission and wouldn’t return to the sanctuary of the office until it was completed. After watching the Air Dog competition for a while, I set out to find the secret, perhaps nonexistent, bar. My first idea: head toward whatever bar/restaurant I saw first. I was sure someone in the industry would know something about a new speakeasy in town. 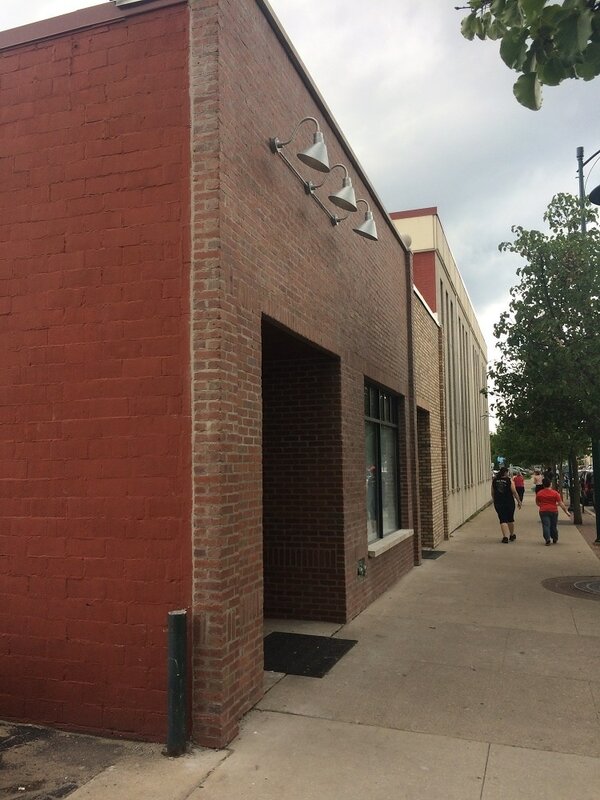 My feet led me down the sidewalk to the corner of Hall and Front Street to a large brick building—previously a candy factory—North Peak Brewing. It had been a long time since I felt the rush of cold air that floods out when entering a building, and I had almost forgotten. I sat down on a tall wooden bar stool next to the register, and poked my nose into a conversation two waitresses were having. “Excuse me,” I started. They both wore the same black uniform with a small patch on their chest reminding customers of the brewery’s name. I began reciting the leads my boss had given me and one of the waitresses cut me off. Wow, I thought, that’s helpful. But it really was more helpful than I first suspected. I thanked her and left the brewery. On the street corner, a blue Jeep with no doors or roof accelerated from the stop sign. Several young kids hung from the openings singing along to the radio. Directly across from me sat a flower shop on the corner, The Flower Station. I remembered what my boss had said, “Connected to a flower shop or something.” This was close after all, maybe I’d get lucky. To my dismay, I did not. The employees laughed when I mentioned my lead and said there was no speakeasy around their small flower shop. They hadn’t heard anything either so I left the jingle-belled door with my head down. From there, I trekked down Front Street back toward downtown. Crowds of people in town for the Cherry Festival wandered the streets, exploring shops and letting their dogs sniff each other. Unlike the rest, I was not strolling leisurely. I had a mission. I was twisting my head to and fro, stopping randomly to peek around alleyways. By now it had become more of a personal vendetta. I wanted to be the one that found this underground speakeasy that no one could find. He looked down Union Street, the way I had come, and pointed around the corner. “Turn left on Front Street there and just past a parking lot is an empty looking building with an address on it, that’s it.” I was amazed someone could actually give me directions. I shook his hand and thanked him effusively. All I had in mind was to find the building, take a few quick pictures, and enter back into the office a conquering hero, wielding my phone with proof. But when I found the building, it was not what I expected. A glass door with the building’s address printed in black letters had a small building permit taped inside. The windows on the door and the few that lined the front were covered up with sheet paper. I stood there a moment wondering if I was in fact at the right location. It seemed too incomplete to host an underground bar scene, but maybe that was their intention. I couldn’t believe what I heard, I couldn’t let them pass. I swung around and introduced myself. “You were here?” I asked. He nodded his head and reaffirmed he had attended their Industry Night party a few nights back, but he didn’t think they were officially open. As he talked his taller friend chimed in, “Why don’t you try the door? You might be able to talk to them.” It was a grand idea, why go back with just pictures if I could talk to the owners, maybe even get in? Without a second thought, the man grabbed the dusty door handle and pulled the covered door wide open. We all looked at each other for a moment and he motioned me inside. It was like a completely different world. The size of the room almost felt like a large restroom, with a tall ceiling and walls painted a strong, bright yellow. On the left was a small shelf with a register resting upon it, to our right, the room extended a few feet with several wooden rocking chairs set up facing the window, against the back wall was a tall metal rack with colorful teacups organized along its shelves. “What is this?” I asked. The taller gentlemen motioned me toward the far wall where a small, beautifully crafted handle was mounted. I glanced down at the handle. It was spiraled, made of some kind of wood, and polished exquisitely. The yellow background of the wall complemented its features. If I went back now I would have plenty to give to my boss, but the thrill of being able to go inside overtook me. 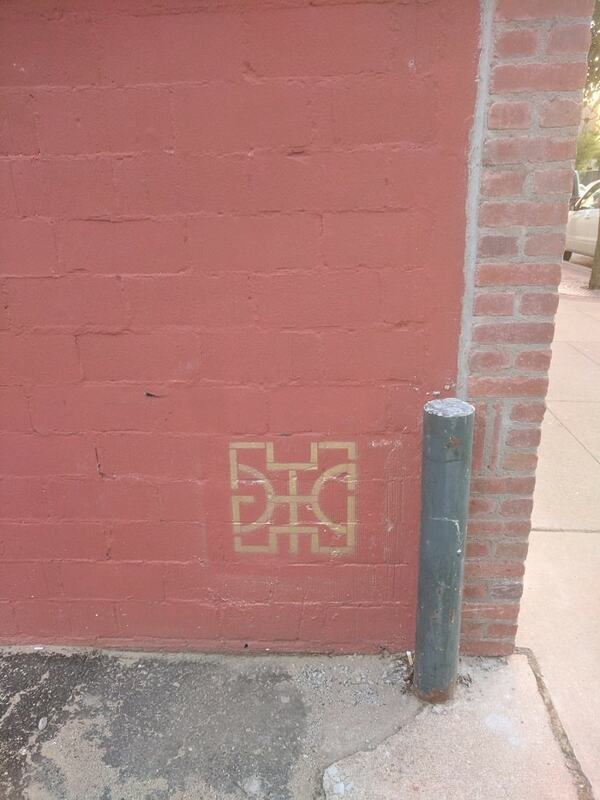 Look for this occult-looking symbol and you’ve found it. The yellow walls of the first room were quickly drowned out by a dark, reddish-tinted hallway that stretched beyond the secret door. The floors were polished concrete and glistened dark red, and as I was led down the hallway the glow of a light emerged from beyond the corner. A huge room opened up to me. Now I understood what they did with the rest of the building. Directly ahead was a large wooden bar with a mirror that rivaled its length. In the center of the room, like a bowling lane, was a straight line of chairs, two facing each other at a time, like private little islands all in a row. Against the wall to my right was an assortment of lounge chairs and tables that seemed spastically arranged. Each chair was different. One lounge chair, dark purple, only had a back on one side. Some were crescent moon shaped. All were in a different color. As my shoes clapped on the concrete, I was led farther into the room where a man in a T-shirt and sandals sat. When he saw us, his demeanor suggested he was not expecting visitors. He quickly rose though, and with a smile shook my hand while my tall acquaintance explained who I was and why he had let an outsider in. After our initial introductions, Glenn Durfee, one of the co-owners, offered me a tour. “I’m assuming no pictures?” I said. He cracked a wide smile before nodding his head, “That would be best, please no pictures.” He showed me around the dimly lit speakeasy, letting me view several of the private rooms, which were smaller versions of the main gathering room, and both restrooms, which I half-jokingly announced I could enjoy a drink in. “That’s what we’re going for,” Glenn laughed. “We want everything to be as comfortable as possible.” While we walked and talked I mentioned writing this article and Glenn was hesitant. I loved the secrecy. I loved that he didn’t want me to take pictures and I loved that he wanted to check first on what I could talk about. It felt real, and sketchy and exciting. Near the back of the building was a small office, open and bright, where a woman was working at the desk. She wore a bright purple feather in her dark hair, taking me back to the 1920s. On our way out Glenn and I talked about his plan for the speakeasy. “Well, we are going to run a wholesome refreshment company out of the front of the building, where you came in,” he said. Before continuing he pulled out his phone and showed me an image, “That’s what will be on the front, and probably what people will call it, but the speakeasy doesn’t really have a name.” He motioned down a different hallway near the front of the bar. “This is my favorite door in the whole building,” he said, pushing down on the long handle. There we were again, in the bright yellow tea room, only this time it was through a door I hadn’t even noticed when I came in. There was no knob on this side and would only be noticed by a very observant customer. We stood there and joked some more about the tight-lipped speakeasy. “So, how will people get in?” I asked. “Well, we will have a bouncer at this door,” (where I came in), Glenn told me, “and people will set up a reservation on our website. After you register you will get a password. Without that password, the bouncer won’t let you in. Everyone’s passwords will be different.” The entire time he explained his process I could tell he held back a smile. The love for his bar was evident and addictive. I wanted to be a part of it. I wanted to set up my reservation and enter the small tea front with a lovely date on my shoulder, approach the large bouncer in the corner and whisper a password to him to enter the most magnificent, secret party in all of Traverse City. Thinking back on my time spent chasing the elusive speakeasy, my mind wanders back to B telling me that they were Traverse City’s worst-kept secret. Although this piece may help some to find the white whale of bars, it was by no means easy to locate. In fact, I think you will all find that it’s Traverse City’s best-kept secret. Sign up for MyNorth’s free Food & Drink newsletter for the latest restaurant news, food travel, recipes, and more!